WHEN: The Hoover Public Library is open seven days a week: Monday - Thursday 9 a.m. to 9 p.m., Friday 9 a.m. - 6 p.m., Saturday 9 a.m.-6 p.m, Sunday 2 - 6 p.m.
Want to try a new type of exercise? Try a Yoga DVD or Zumba Fitness! Hungry for new recipes? We have many books on healthy cooking like Eating Well’s Comfort foods made healthy! 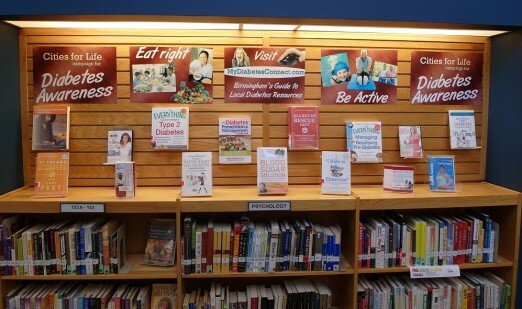 Check out Hoover Public Library’s very large collection of books, dvd’s, audiobooks (including downloadable ebooks and audiobooks) on healthy living and diabetes prevention and management. We have exercise and fitness videos, cookbooks, books on nutrition and weight loss, as well as many popular health and fitness magazines that can be checked out. Have a question about what we have? Call us today at (205) 444-7800 or head over to our blog <hooverlibrary.org> to learn more.